The National Investigative Agency (NIA) raids at the homes of three Jaish-e-Mohammed (JeM) terrorists in Awantipora of Jammu and Kashmir comes in the aftermath of Pulwama terror attack. Srinagar: The National Investigative Agency (NIA) on Wednesday carried out raids at the homes of three Jaish-e-Mohammed (JeM) terrorists in Awantipora of Jammu and Kashmir. If reports are to be believed, the raids are also being conducted at homes of terrorists, including Sajjad Bhat whose car was used in the dastardly Pulwama terror attack in which 40 Central Reserve Police Force (CRPF) jawans were killed on February 14. The development comes a day after 12 Indian Air Force Mirage 2000 jets dropped six 1,000 kg laser-guided bombs over two Jaish-e-Mohammed camps in Pakistan-occupied Kashmir’s (PoK) Chakothi, Muzaffarabad areas and pounded JeM’s biggest training camp in Balakot. In a pre-dawn operation that lasted just 21 minutes, India mounted a massive offensive on Jaish-e-Mohammed (JeM) in Pakistan on Tuesday when its air force carried a ‘non-military pre-emptive air strike’ on three JeM camps, killing nearly 300 terrorists in the attack. The pre-emptive action against terror camps in Pakistan by India came nearly two weeks after the dastardly Pulwama terror attack in south Kashmir. 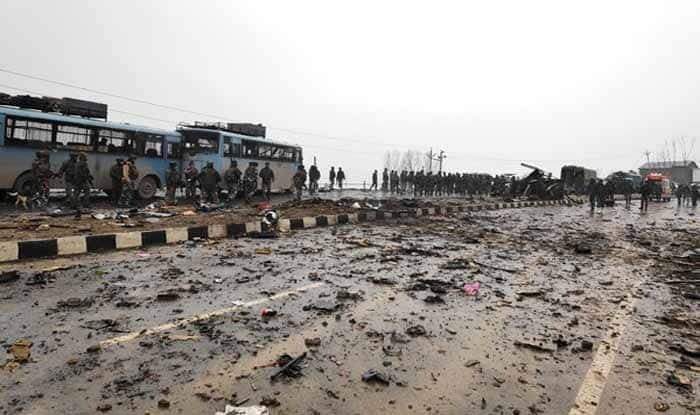 Forty Central Reserve Police Force (CRPF) jawans lost their lives as JeM terrorist Adil Ahmad Dar rammed an explosive-laden vehicle into a bus of the convoy of security personnel on February 14, nearly 30 km short of its destination – the Bakshi Stadium transit camp in Srinagar. The CRPF convoy, consisting of 78 vehicles carrying 2,500 jawans, was attacked around 3.15 PM in Lethpora on Jammu to Srinagar highway.